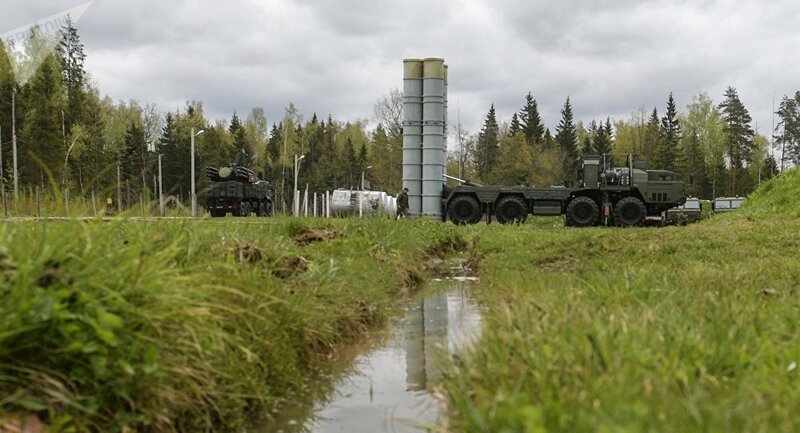 According to the Russian defense contractor Almaz-Antey, the army should expect to add to its 19 S-400 air defense system regiments by the end of the year. MOSCOW (Sputnik) – The Almaz-Antey concern, which manufactures the systems, said in a statment: "as part of its obligations [to fulfill its] state defense order, transferred a regular (second for October and third for 2017) regiment of S-400 Triumf air defense missile systems to the Russian Defense Ministry," the manufacturer said. "By the end of 2017, the company will supply the Russian Defense Ministry with another S-400 regiment. Thus, this year the state customer will have been sent four [artillery] regiments equipped with the system," it said. S-400 Triumf anti-aircraft weapon systems during combat duty drills of the surface to air-misile regiment in the Moscow Region. The S-400 Triumph is designed for highly effective protection against air strikes, strategic, cruise, tactical and operational-tactical ballistic missiles as well as medium-range ballistic missiles in combat and radio electronic countermeasures. The S-400 systems were delivered to Syria in November 2015, after the Turkish Air Force shot down the Russian Su-24 bomber near the Syrian border. The systems are protecting the Hmeymim airbase useed by the Russian air power for strikes against terrorists in the country.